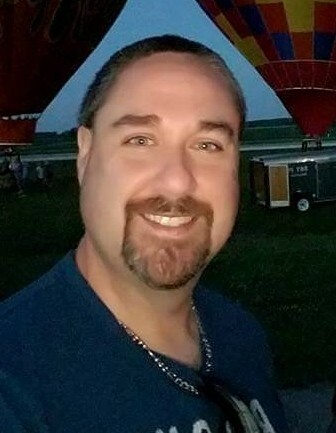 Jeffrey Daryl McMillion, age 44 of Reynoldsburg, Ohio, formerly of Sardinia, Ohio died Wednesday, October 17, 2018 at the Mt. Carmel East Hospital in Columbus, Ohio. He was a sales consultant for Hampton Inn at Scioto Downs in Columbus, Ohio, a graduate of the Eastern High School class of 1992 in Sardinia, Ohio and Columbus State College in Columbus, Ohio, an avid OSU fan and enjoyed traveling and spending time with his family. Jeff was born August 23, 1974 in Cincinnati, Ohio the son of David McMillion and wife Brenda of Sardinia, Ohio and Darlene (Hoskins) Southwick and husband Charlie of La Follette, Tennessee. He was preceded in death by his grandparents – William and Carrie Hoskins and Gerald McMillion and one sister – Christine Hoskins. In addition to his parents, Mr. McMillion is survived by his wife of 15 years, Emily (McAnlis) McMillion, whom he married June 21, 2003; eight brothers and sisters – Sarah Hagle of Kentucky, Stephen Rebak of Tennessee, Samantha Pearson and husband Jake of Louisiana, Jessica Ridenour of Tennessee, Ashley Moore and husband Reese of Tennessee, Gary McCartney and wife Wendy of West Carrollton, Ohio, Carl Garrison and wife Angel of Paris, Ohio and Bobby Garrison of Georgia; grandmother – Freda McMillion of Milford, Ohio; father and mother-in-law – Dale and Faith McAnlis of New Galilee, Pennsylvania; two brothers-in-law – Adam McAnlis and wife Misty of Wampum, Pennsylvania and Ethan McAnlis of New Galilee, Pennsylvania and many nieces and nephews. Funeral services will be held at 11:00 A.M Monday, October 22, 2018 at the Sardinia United Methodist Church, 110 Graham Street, Sardinia, Ohio 45171. Jaime Wirth will officiate. Visitation will be from 2:00 P.M. – 4:00 P.M. Sunday, October 21, 2018 at the Cahall Funeral Home in Mt.Orab, Ohio. Interment will be in the Sardinia Cemetery in Sardinia, Ohio.